My sister is a married lady! How crazy is that! I'll post a few more photos when she actually gets back from her honeymoon and has all the photos, but here are a couple things for the time being. Also it's Matt's birthday, so happy birthday Matt - welcome to the fam! Here is the first look video I did for them a few weeks ago! I'm not a professional, clearly, but it's fun to whip out the camera and remember some of my editing skills. Hopefully I'll get to do a few more videos here and there and really hone my skills! The wedding week was great, things went pretty smoothly and the day of was magical. Liv woke up early and had her hair done by Lexi McPherson who did fantastic. Her makeup was done by the incredibly talented Madelynne Morgan. She is seriously so fantastic, Liv's makeup looked beautiful and she got there in the wee hours of the morning to make sure it was perfect. She's truly awesome and I highly recommend her! Liv and Matt had a beautiful sealing in the Salt Lake LDS Temple and it was so amazing to be there with them and watch them be married. Their photographer and videographer were so on top of it and I can't wait to see the photos from the day of! 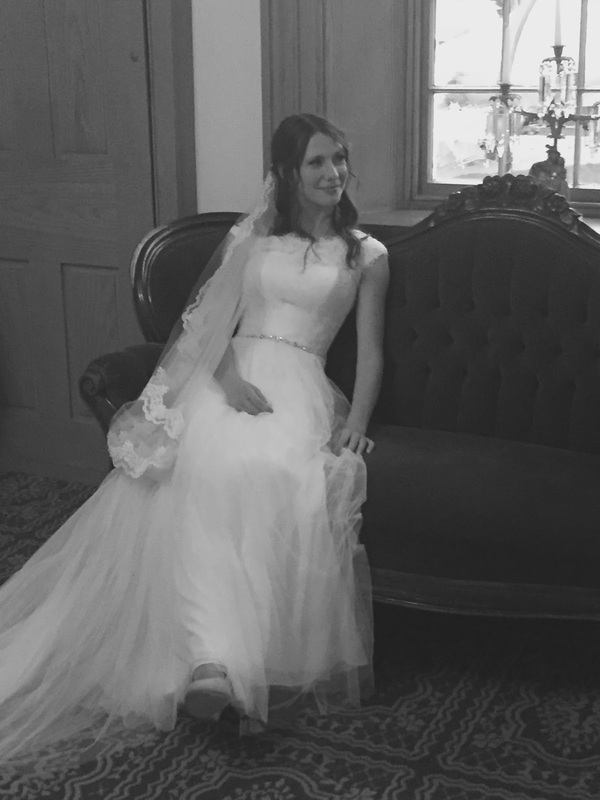 For now, just check out these couple photos from the bridals/a few from the day of that the videographer snapped. Megan Owen also snapped a couple pics the day of, she also does photography sometimes and she's awesome! I can't wait to see the video! Both the Meg's were seriously OUT OF THIS WORLD. So awesome and fun and they were so cute with our family and made sure Liv had all the shots and video she wanted. The flowers were done by the amazingly talented Bailey Jo Lucas and guys she was a dream. Just check out that bouquet. She was so sweet and wonderful and so fun to work with. Every single person my sister hired to do things for the wedding were wonderful. They made the day so easy! Matt and Liv had their luncheon at the Joseph Smith Memorial Building, where we had an introductory story as per tradition, the traditional song "When I Fall In Love" and some funny stories about the two newlyweds. The reception was at the Lion House and it was a beautiful garden party perfectly fit for my sister. 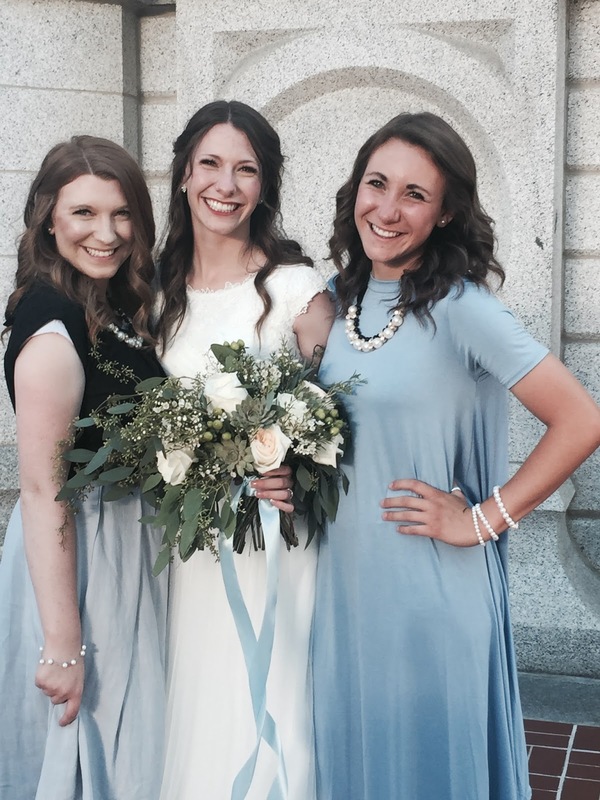 Basically everything was a dream, and I am so happy for my sweet sister! Message me if you have any questions about the vendors or anything! I got my skirt from Cozy Boutique, Bethany got her dress from Piper and Scoot, and the groomsmen ties were from Tie One On. Happy Tuesday everyone, happy birthday Matt and happy honeymoon to the newlyweds!